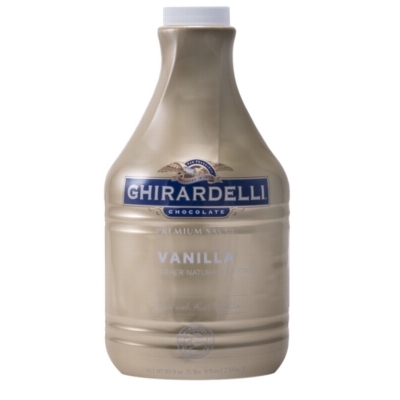 Experience the difference of real vanilla in new Ghirardelli Vanilla Sauce, featuring no high fructose corn syrup and no artificial flavors, colors or preservatives. Decadent vanilla flavor and a rich mouth feel make it perfect for creating the ultimate vanilla latte and other specialty beverages. Pump sold separately. One case = 6 bottles. INGREDIENTS: Sugar, water, skim milk, sweetened condensed milk (milk, sugar), natural flavor, extracts of oregano, flaxseed and plum (to preserve freshness), gum arabic, vanilla extract, disodium phosphate, salt, xanthan gum.